2-hour pool rescue session to give participants the skills to manage a capsize situation. This sessions focuses on wet exit and recovery skills. This session will introduce you to the basic techniques and safety aspects of sea kayaking. Improve your skills and confidence in challenging kayaking conditions with this full day of intermediate kayaking skills training. Our Eskimo rolling sessions are conducted in the warm and comfortable environment of an indoor heated swimming pool. With good instruction the skills to master the Eskimo roll are easier than you think. Wanting to increase your kayaking skills? 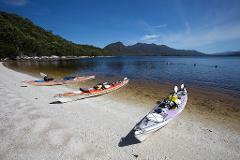 The course covers the tips & tricks used by guides on Tasmania's premier kayak expeditions. Develop the know how to plan trips yourself. Learn "On the water" from Tassie's best.